The "straddling bus" now exists in a sorry state. 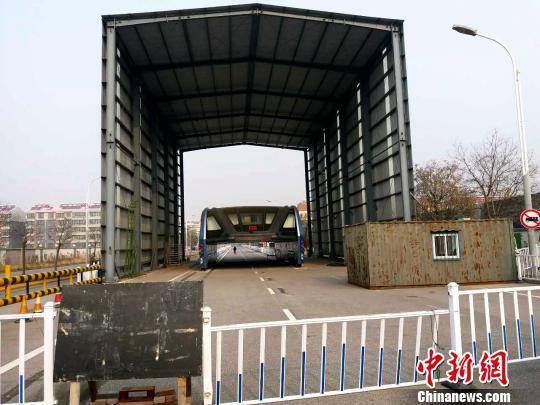 The Transit Elevated Bus (TEB) was unveiled several months ago in Hebei province’s Qinhuangdao City in China. The electric-powered, 4.8 meter (~16 ft) tall elevated bus straddled the road to allow cars to pass underneath it. Its design was meant to ease traffic as well as provide the people of the city an alternative mode of public transportation. Once a sign of progress in the city, it has now fallen victim to a series of set-backs, mismanagement, and flawed design. A local reporter followed up on the bus but instead of finding a working vehicle, the reporter found a rusting heap of metal guarded by a pair of security guards who couldn’t even get in touch with management. It is the culmination of a string of set-backs that befell the once promising piece of technology since its introduction in August. The problems started with the design of the bus. With its vertical clearance just above 2 meters (6.5 ft), it didn’t make sense to deploy it on roads that also allow vehicles up to 4.2 meters (~14 ft) in height. There were also concerns that the TEB would be too heavy on Chinese roads, fearing that it might fall victim to sinkholes. Additionally, there are also accusations of fraud and postponed tests which lead investors to understandably pull their money out of the venture. It now sits on a leased road in the city and it currently obstructing 3 lanes of traffic, much to the irritation of local residents. This case highlights a crucial lesson for city planners who wish to integrate new technologies within their cities: there must be a balance between innovation and practicality. It can come in the form small incremental changes to the existing infrastructure like Chile’s solar powered trains. It must also be unobtrusive when deployed so as not to disturb the everyday activities of its inhabitants. An example of this would be Singapore’s Smart Nation Program where a bunch of sensors and cctv cameras were scattered throughout the city allowing it to monitor flood levels, and traffic, among other things. Hopefully, the local government in Qinhuangdao City is able to learn from this so that they will be able to produce better, thoughtful plans in the future.